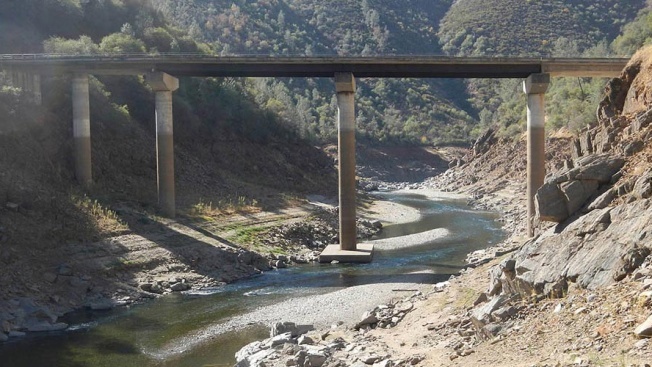 Photo of Tuolumne River, CA showing the effects of drought. As the state's historic drought continues, farmers are straining California's rich groundwaters so fast, the soil is actually sinking. Recent reporting from Reveal, part of the Center for Investigative Reporting, shows that groundwater, mostly from rural wells, now makes up the majority of all water use in California. The pumps themselves are using up to 5 percent of the state's entire supply of elecrtricity. All this pumping depletes ancient aquifers deep underground, causing the earth to compact and sink. One side effect of this environmental change is that long, heavy pieces of infrastructure like roads and bridges are sinking as well and suffering damage as the earth buckles around it. Reveal reported that two bridges in Fresno County "have sunk so much that they are nearly underwater and will cost millions to rebuild". In May, the NBC Bay Area Investigative Unit reported that many of California's bridges are already in a state of disrepair. 10% of the Bay Area's 3,935 bridges need major fixes, according to Department of Transportation reports. State and federal engineers reported that 3,000 bridges across all of California are in need of replacement or repair. Investigative472 Bay Area Bridges: "Structurally Deficient"
The current drought only adds to the stresses on California's bridge and highway system. The United States Geological Service(USGS) is well aware of this. On its drought website, the agency warns that the sinking earth caused by over-pumping will lead to "permanent loss of groundwater storage in the aquifer system and infrastructure damage." Yet, Reveal reports that the state still does not have a thorough understanding of the extent of the problem: "No agency is tracking the sinking statewide, little public money has been put toward studying it and California allows agriculture businesses to keep crucial parts of their operations secret." Sneed is practically begging to expand her limited research. A hodgepodge of about 350 ground-elevation monitors – many leftover from the 1960s – are all she and other researchers have to track tens of thousands of miles that are sinking. This includes vineyards in Sonoma and Napa counties, areas around Paso Robles and Santa Barbara, and agricultural regions encircling Los Angeles, all which have shown signs of sinking, according to a California Department of Water Resources report. 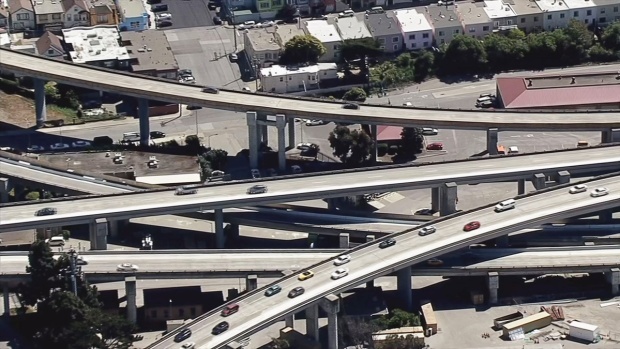 472 Bay Area Bridges: "Structurally Deficient"
NBC Bay Area’s Investigative Unit breaks down the bridge inspection data from the Department of Transportation and uncovers hundreds of well-used overpasses in need of major repairs. Senior Investigative Reporter Stephen Stock reports in a story that first aired April 24, 2015.